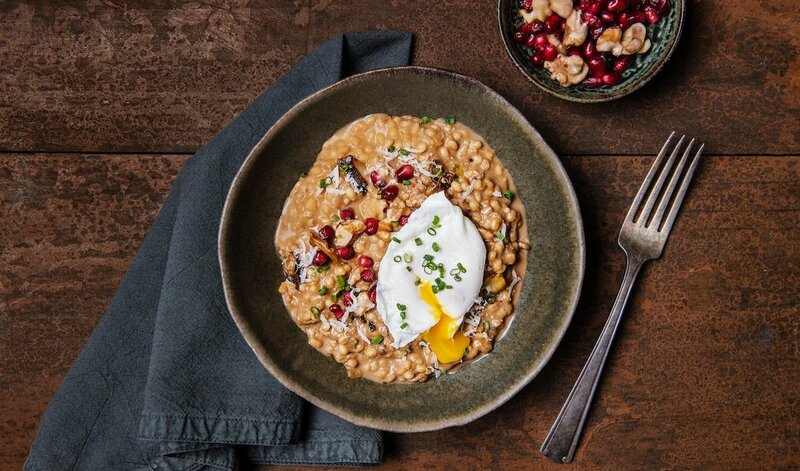 Creamy, savory wild mushroom risotto is topped with a poached egg, toasted walnuts and pomegranate seeds for a burst of exciting flavors and textures. Bring Knorr® Liquid Vegetable Base and 60 ml Knorr® Ultimate Intense Flavours Wild Mushroom Earth to a simmer in a sauce pot. In a large skillet, melt 55 gram butter over medium heat. Add half of the minced leeks, and cook until translucent (about 3 minutes) Add in thyme, bay leaves and half of the minced garlic. Cook until garlic is softened. Add in the barley and stir to combine, toasting the barley for about 1 minute. Deglaze the skillet with the white wine and slowly start adding the warm vegetable stock 1 cup at a time, continuously stirring. Continue to add in stock in increments until none remains and the barley is tender and creamy. Meanwhile in another skillet, heat olive oil over medium-high heat. Add in the sliced mushrooms and remaining leeks. Cook until mushrooms soften and begin to caramelize. Then add remaining garlic and cook until mushrooms and garlic are tender. Add the mushroom mixture to the barley. Stir in remaining 30 grams of butter, lemon zest, parmesan cheese and mascarpone. Season with remaining 30 ml of Knorr® Ultimate Intense Flavours Wild Mushroom Earth and season with salt and pepper. Serve each portion of risotto in a bowl with toasted chopped walnuts, pomegranate seeds, additional shaved parmesan, minced chives, and a seasoned poached egg.